Vince Gill and Amy Grant opened the ’08 Senior Open golf tournament last night, the most big hearted couple I have ever seen on stage. They were performing in support of Challenge Aspen, an education and recreation facility designed to give people with disabilities a chance to take their lives up a notch, year round. As light hearted as they were big hearted, Vince was full of stories and one liners. Kim, their backup singer, had a talent for impersonating Cher. She sang an example and then Amy remarked on how Cher was an early influence. Vince quipped with something to the effect of “yeah, and now we’re Sonny and Cher”. He got a great laugh out of the crowd and a quirk “not quite, honey” look from Amy. Rock on Vince and Amy, Sonny and Cher aint got nothin on y’all. After the trip to Fargo, I had an opportunity to see my cousin Tyler race. 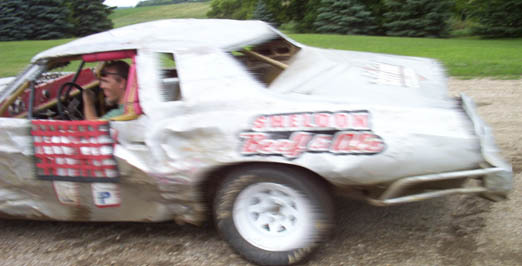 He placed second despite a mash up that destroyed his right rear fender guard and a penalty that pushed him to the end of the lineup. The next day I was lucky enough to join in on the repair process. 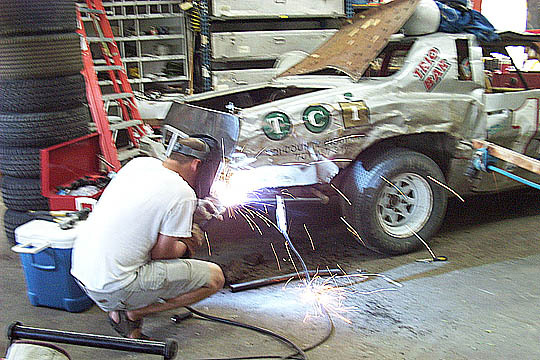 Here we see Tyler removing the damaged pipe of the fender guard. Notice the blue “safety cooler” nearby. Full of ice cold Busch Light. Fortunately his big brother Bob took a break from NASA to assist in the repair. I got to take a test drive. I drove so fast the camera had a hard time capturing a clear picture. I’m not wearing a helmet but I have the blue “saftey cooler” strapped in beside. After this repair and my phenomenally fast test drive Tyler placed 1st in the Bomber Feature last Tuesday at the Sheyenne River Speedway in Lisbon, ND. UPDATE: Tyler went on to win the season championship at the SRS. Last week, on my trip though North Dakota, I stopped to get a picture of one of the three intercept aircraft that flew into history during the events of 9/11/01. I was perplexed by the plaque which made no mention of Major Dean Eckmann’s historic flight. Coincidentally, as I was about to leave, this fellow showed up driving a limousine sporting a small American flag fluttering on each side of the vehicle. 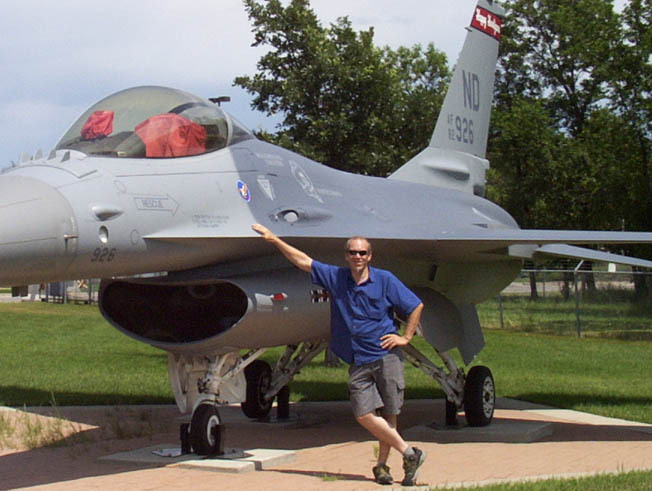 Field McConnell, a former pilot of the prestigious Happy Hooligan’s, asked me to take a picture of him beside an F4 phantom he used to fly including a jet painted yellow in the background for a visual metaphor about a statement he made towards Janet Reno. Took a three and a half hour election judge crash course this evening. Alot of paperwork and two voting machines to operate. One for paper ballots and the other for electronic. I didn’t have much faith in the electronic ones before the class, but i learned how redundant systems and digital signaturing of the machine ensure a valid vote. Paper proof is written for the voters to view and then stored in a sealed bin. They are much better for the vision impaired and even blind voter. When I refuled for the the last leg at a station in Eirie CO my gas guage said I had two gallons left, after refuleing it seemed I had bought an extra gallon above my tank’s capacity. I’ve been offline all this time in preparation and travel on a North Dakota trip. As luck would have it during the trip I missed a meeting with Neil Armstrong. No regrets though, I reconnected with people of similar mettle.